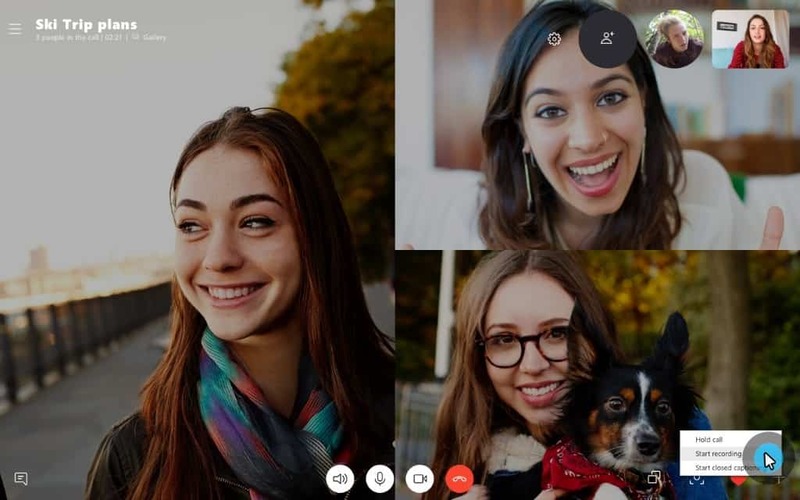 Users of Microsoft's Skype messaging application for desktop and mobile operating systems can use a new call recording feature that Microsoft built into the application recently. Call recording functionality has been a much requested feature and while there have been options in the past to record Skype calls, all of them required the use of third-party software or direct audio & video recording. The new built-in recording functionality changes that. 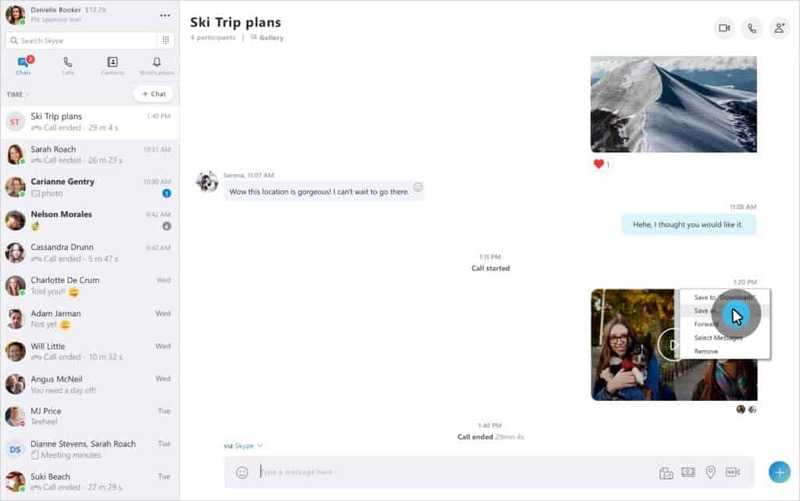 It is available in the desktop and mobile versions of Skype and will become available in mid September 2018 in the Windows 10 app version of Skype as well. On desktop: click on the plus-icon during calls and select "start recording" from the context menu that is displayed. On mobile: tap on the plus-sign during calls and select "start recording" with another tap to start the recording. Skype displays a notification to all users that the call is being recorded; this is done so that anyone who participates in the call knows that it is being recorded. Recorded calls are stored for 30 days before they are removed. One interesting feature of call recording in Skype is that recorded calls become available to all users and not only the user who started the recording. Anyone who participated in the chat can download the recording in that 30 day period. Desktop users need to select the "more options" button when the chat is open and then "save to downloads" or "save as" to save the call to the local system. Save to downloads stores the call in the Downloads folder on Windows, save as displays the save dialog to pick a custom folder to save the recorded call. Calls are recorded as mp4 files that all modern media players support. Skype mobile users need to tap and hold the recorded call in chat to display a menu. The selection of save from the menu stores the file in the mp4 format on the local device. Recorded Skype calls can be shared. Just follow the process to download the recording described below but select the Forward option instead of save to forward it to contacts. Skype recordings play in the majority of media players. Just double-click or tap on the downloaded file to play it in the player associated with the format on the desktop or mobile system. It is still possible to use third-party programs like Audacity to record conversations directly if that is what you prefer. While you may need to check whether that is legal in your jurisdiction, the main advantage doing so is that the recording is not stored on Microsoft servers for the next 30 days. Now You: Do you use Skype or another software to make calls? An excellent feature, long overdue. I used to use Skype, up until Microsoft removed peer-to-peer calling and required the use of their servers. Then I stopped using it almost entirely (sometimes, I need to). I haven’t replaced it with anything — I pretty much just stopped using the internet for such things entirely. Now, I just use my phone as a phone instead. Great! Now all of those so called privacy related calls between you and your doctor can be saved on a POS leaky Windows system in some far away office! Didn’t you hear the news? The sheer *awesomeness* of Windows 10 *repealed* HIPAA and HITECH! Just like the sheer *coolness* of Windows 95 repealed the Sherman Anti-Trust Act! Once the largest shareholder of an American tech company surpasses a net worth of around $50 billion, laws no longer apply! It’s right there in the Constitution (as interpreted by the current federal bench)! Skype is forgotten and uninstalled ever since they started fooling around with the clients, “Modern” UI crap and abandoned the working good old Win32 client. Plenty of other alternatives. Most video calling is done by me on mobile devices anyway since their front-facing camera are WAY AHEAD of what PC webcams can achieve in terms of video quality. I used it until all communication was re-directed via NSA servers…. It’s free but I paid up for the Pro version. Works great. Have used it for maybe 3 years now. I have limited cellphone minutes on the plan I’m on (but unlimited text & data). So Skype sells a subscription plan for around $3/month that lets me call any phone number (doesn’t have to be a Skype user) in USA/Canada as an outgoing call from Skype for free. I can call wherever I run Skype, which is my cellphone or one of my PC’s. I assume that’ll apply to Skype as well. Does anyone use Wire? Or more to the point, has anyone succeeded in convincing anyone they want to talk with to also install Wire? who is she in the left?